This month we’re starting with Ian McEwan’s Atonement which is about thirteen-year-old Briony who misconstrues an event she witnesses one scorching summer day in 1935 leading her to make an accusation she will regret for the rest of her life. Atonement reminded me very much of L P Hartley’s The Go-Between in which young boy becomes caught up in the relationship between a young man and woman and is irreparably damaged by it. Julie Christie played a starring role in the film adaptation of The Go-Between just as she did in Thomas Hardy’s Far From the Madding Crowd which I’m unable to watch without snivelling. Even the music starts me off. There’s a scene in Hardy’s novel involving sheep which makes me cry all the harder unlike the one in Auður Ava Ólafsdóttir’s very funny Butterflies in November in which a dead sheep is wrestled into a car’s passenger seat. Butterflies in November is set in Iceland where the novelist Sarah Moss spent a year as a visiting academic. She writes about what it’s like to be a foreigner in a country so small that everyone seems to know each other in her entertaining memoir, Names for the Sea. Iris Murdoch’s The Sea, The Sea is set nowhere near Iceland and I can remember very little about it having read it a very long time ago but I do know that it won what was then called the Booker Prize. As did Oscar and Lucinda which is my all-time favourite winner (so far). Gawky, misfit Oscar Hopkins meets fellow gambler Lucinda Leplastrier – equally the misfit and unexpectedly in possession of a large fortune – on board a ship sailing to Australia where both wager their futures on the construction of a fantastical glass church. Set against the backdrop of nineteenth-century colonialism it’s a wonderfully witty, vibrant pastiche of a Victorian novel. This month’s Six Degrees of Separation has taken me from an English summer’s day in 1935 to nineteenth-century Australia. Part of the fun of this meme is comparing the very different routes other bloggers take from each month’s starting point. If you’re interested, you can follow it on Twitter with the hashtag #6Degrees, check out the links over at Kate’s blog or perhaps even join in. This entry was posted in Reviews, Six Degrees of Separation and tagged Atonement, Auđur Ava Ólafsdóttir, Brian FitzGibbon, Butterflies in November, Far from the Madding Crowd, Ian McEwan, Iris Murdoch, L P Hartley, Names for the Sea, Oscar and Lucinda, Peter Carey, Sarah Moss, The Go-Between, The Sea The Sea, Thomas Hardy on 4 August 2018 by Susan Osborne. A few years ago, I read Auđur Ava Ólafsdóttir’s slightly wacky, Murikamiesque Butterflies in November which I enjoyed very much. Her new novel, Hotel Silence, is a much quieter, more conventional piece of fiction which follows a heartbroken man who’s bought a one-way ticket from his Icelandic home to a country devastated by war and holding its breath that peace has been struck. Jónas has been celibate for years although not by choice. The love of his life has ditched him, telling him that the daughter he thought was his is another man’s. He visits his demented mother, patiently listening to the recital of the story of his birth and her accounts of the many wars that have afflicted the world. He has a waterlily tattooed over his heart in honour of his daughter whose name it is. He listens to his neighbour list the many wrongs men have done women and his worries that his wife is unhappy. Never far from his mind are thoughts of killing himself but he can’t bear to inflict the discovery of his body on Waterlily. Instead, he decides to go abroad, booking a week at the Hotel Silence. He packs a few clothes, takes the diaries he kept as a young man and, as an afterthought, a few tools. He finds the hotel the worse for wear and sets about putting his room in order, attracting the attention of the young woman who runs the hotel and her son. Soon, Jónas finds others asking for his help and a week turns into three. There’s a gentler, more melancholy humour running through this novel in contrast to the off the wall moments of Butterflies in November. Jónas is sympathetically portrayed, a man left somewhat puzzled by what has happened to his marriage, mining his diaries for clues about the young man he was when he first met his wife. His visit to the unnamed country taking its first steps towards recovery serves as an effective metaphor for his mental state as he pitches in to help survivors marked by horror and atrocity. The theme of relationships between man and women underpins this novella, deftly handled rather than laboured, but always there. It’s a quietly powerful piece of fiction managing to both entertain and deliver a message of hope through shared humanity and cooperation. This entry was posted in Reviews and tagged Auđur Ava Ólafsdóttir, Brian FitzGibbon, Hotel Silence, Icelandic fiction, Pushkin Press on 23 February 2018 by Susan Osborne. Sometimes books arrive with stories about how they came to be written which are almost as fascinating as what’s inside them. Hallgrímur Helgason’s The Woman at 1,000 Degrees grew out of a canvassing phone call he made on behalf of his partner, a candidate in Iceland’s municipal elections. The third name on his list turned out to belong to an eighty-year-old woman living in a garage who kept him talking for nearly an hour. A few years later, Helgason chased down the identity of his late conversationalist to find that she was Brynhilder Georgía Björnsson, granddaughter of Iceland’s first president. Renaming her Herra, which is both a woman’s name and Icelandic for ‘mister’, Helgason spins a tale which is funny and tragic, hanging it on the bare bones of Björnsson’s story. Herra lies on a bed in a rented garage, her trusty laptop and ancient hand grenade at her side. She’s made herself an appointment at the crematorium, determined not to see out another Christmas. She keeps herself occupied with her many stolen Facebook identities, causing havoc by merrily hacking her daughter-in-law’s email and telling us her story. Born in 1929, Herra is the daughter of a country girl and a diplomat’s son, brought up for seven years on one of Iceland’s many islands before her father finally got around to acknowledging his daughter taking her and her mother to Denmark where his father was Iceland’s ambassador. They settle into society life then war breaks out. Denmark is occupied by Germany while Iceland, then part of Denmark, is taken by the British. Herra’s father opts to become a Nazi, welcomed into the party with open arms as a child of the fabled Aryan island. Herra’s mother thinks the less of him, staying in Copenhagen while he takes himself off to Lübeck, but these two find it difficult to stay apart. In 1941, dispatched to Germany with promises to follow, Herra waits on Hamburg station for her mother until her father says he can stay no longer leaving his twelve-year-old daughter alone in what is already a wreck of a city. For the rest of the war Herra fends for herself: homeless, hungry, prey to rapists, she survives on her wits occasionally encountering kindness and love. When the war ends, she and her hapless father find their way to Argentina where another chapter begins. Helgason narrates his novel in Herra’s voice, injecting a good deal of black humour into a story which spends much of its time exploring the worst of human behaviour, managing to both entertain and horrify. Herra adopts a carapace of sharp-tongued wit, determinedly hiding the pain of lifelong grief, loss and suffering. Much of the novel is taken up with the war but there are some nicely discursive episodes – Herra returns to Hamburg in the ‘60s where she’s snogged by John Lennon who’s appalled to find she’s nearly thirty; the 2009 scenes take a few digs at the crookery of the Icelandic financial industry via one of Herra’s sons. It’s a novel that took me a little while to get into – there’s a good deal of family background to get through in the first few chapters – but once Herra’s credentials were established her story took off and I was hooked. Helgason’s acknowledgements are well worth reading, ending on a nice note thanking his readers for sticking with him to the end: Without your support the writer is just a tree falling in the forest. This entry was posted in Reviews and tagged Brian FitzGibbon, Brynhilder Georgía Björnsson, Hallgrímur Helgason, Icelandic fiction, OneWorld Publications, The Woman at 1000 Degrees on 9 February 2018 by Susan Osborne. February’s shaping up quite nicely with lots of new titles and paperbacks to ease us through those dark, dank days and long nights here in the Northern Hemisphere. I’ll begin with Hallgrímur Helgason’s The Woman at 1000 Degrees whose eighty-year-old narrator lives alone in a garage, laptop and hand grenade at the ready. Herra recounts her adventurous life in a voice ‘by turns darkly funny, bawdy, poignant, and always, always smart’ taking us from ‘war-torn Europe, then to Argentina and finally to post-crash Iceland where the last pieces of this haunting puzzle fall into place’ according to the publishers, putting me in mind of the excellent Himmler’s Cook. 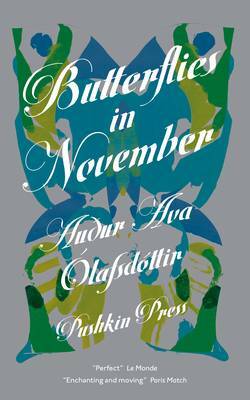 We’re sticking with an Icelandic author although not the country for Hotel Silence by Auđur Ava Ólafsdóttir whose wonderfully eccentric Butterflies in November was a treat for me. Divorced, lonely and despairing, Jonas takes himself off on holiday not caring where he goes and with no thought of return. He fetches up at the dilapidated Hotel Silence in the middle of a war-torn country. As he learns more about his hosts and the horrors they’ve endured, his own troubles begin to dwindle into insignificance and he pitches in to help. Very much looking forward to this one. Jillian Medoff’s This Could Hurt is set in an American HR department which may not sound the most riveting of backdrops but those of us who’ve done (or are still doing) time in offices know that they’re fertile ground for quiet drama. Five colleagues are hoping their small company will weather the economic storm, led by a steely head of the department. ‘Compelling, flawed, and heartbreakingly human, these men and women scheme, fall in and out of love, and nurture dreams big and small. As their individual circumstances shift, one thing remains constant – Rosa, the sun around whom they all orbit’ say the publishers going on to describe it as ‘achingly funny’ which makes it sound very attractive. My next choice takes us to Paris where C. K. Stead’s The Necessary Angel sees a New Zealand academic involved in a complicated love life which encompasses his estranged French wife, his younger colleague and a troubled young English student. A missing Cézanne throws a further spanner into the works. ‘As much an ode to the power of literature as a nuanced exploration of love, fidelity and the balance of power within relationships’ say the publishers. I like the sound of that. I’m ending this first batch of new titles, still in Paris, with one I’m not entirely sure about: Alicia Drake’s I Love You Too Much. Largely ignored by the adults around him, thirteen-year-old Paul watches from the fringes of his mother, her lover and his father’s lives. Before long he’s seen something he shouldn’t but finds unlikely consolation in Scarlett, a rebellious classmate. ‘I Love You Too Much is a novel of extraordinary intelligence and heart, a devastating coming-of-age story told from the sidelines of Parisian perfection’ say the publishers. It’s the potential for cliché that niggles me here but we’ll see. That’s it for now. A click on a title will take you to a more detailed synopsis should you be interested. There’ll be another selection of February treats shortly. This entry was posted in Random thoughts, Reviews and tagged Alicia Drake, Auđur Ava Ólafsdóttir, Books published in February 2018, Brian FitzGibbon, Butterflies in November, C K Stead, Hallgrímur Helgason, Hotel Silence, I Love You Too Much, Jillian Medoff, The Necessary Angel, The Woman at 1000 Degrees, This Could Hurt on 8 January 2018 by Susan Osborne. This is my fourth literary trip to Iceland this year – Hannah Kent’s impressive debut Burial Rites, Sarah Moss’s Names for the Sea and Michel Rostain’s novel/memoir The Son all took me there in one way or another and now Auđur Ava Ólafsdóttir’s quirky novel Butterflies in November. It opens with the killing of a goose. Our unnamed narrator, relieved to find it’s a bird rather than a child she’s run over, blithely picks up the goose, tosses it in the boot of her car and begins to plan an impromptu early Christmas feast in October. Calling at her lover’s on the way home she finds herself unceremoniously dumped just before she planned to dump him, then ditched a second time by her husband who tells her the colleague he had always professed to detest is pregnant with his child. Time for a change, thinks our narrator, fantasising about a holiday somewhere warm and soothing but soon finds her plans scuppered after her pregnant best friend Auđur is confined to bed for three months. Two lottery wins later – one a mobile home to be delivered to her old home town, the other an enormous amount of money – she sets off on the Ring Road (there’s only one in Iceland) with Auđur’s four-year-old in tow. Challenge enough for our determinedly childless narrator but Tumi is deaf and myopic, used to communicating in sign language. What follows is a very funny road novel which includes a great deal of rain, ex-lovers popping up unexpectedly, a dead sheep wrestled into the passenger seat, a night in a cucumber farmer’s guest house, an Estonian male choir with exotic dancers, random shootings and an ill-fated bungee jump. Punctuating the narrative are italicised passages in which small details of our narrator’s past leak out. It’s an entertaining, slightly off the wall novel whose narrator put me in mind of a Murakami character with her eccentric, idiosyncratic approach to relationships and her breezy acceptance of the puzzling, occasionally downright weird things that happen to her. Ólafsdóttir skilfully develops the relationship between Tumi and the narrator until they become a closely knit team: he is endearing without being sickeningly cute while she is eccentric without being ridiculous. Food figures prominently throughout and there’s a set of recipes at the back quirkily in keeping with the rest of the novel ranging from Undrinkable Coffee and Sheep’s Head Jelly which begins ‘After torching the sheep’s heads…’ to the perfectly sensible Spaghetti Carbonara. An unexpected step too far for me but other readers may enjoy them. I suspect that’s it for me and Iceland for a while although I do have a copy of Halldór Laxness’s Independent People, bought after reading Burial Rites back in August. Are there any literary destinations that kept cropping up for you this year? This entry was posted in Reviews and tagged Auđur Ava Ólafsdóttir, Brian FitzGibbon, Butterflies in November, Iclandic fiction, Pushkin Press on 11 December 2013 by Susan Osborne.